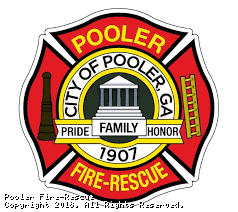 The City of Pooler Department of Fire-Rescue is a professional, all hazards agency committed to providing the highest level of public safety services to the City of Pooler and the Greater Savannah area upon request. We protect lives, property and the environment through fire suppression, pre-hospital emergency medical services, disaster management, rescue operations, fire prevention, and public education. As of January 2018, the Firefighters that make up the Operational Staff of the City of Pooler Department of Fire-Rescue are uniformed members of the International Association of Fire Fighters, representing the Professional Firefighters Association of Pooler, Local 574. As first responders to fires, medical emergencies, rescue operations, hazardous materials incidents, terrorist attacks, utility emergencies, and any other call for assistance the Fire-Rescue Department is requested to, the PFR does not only provide for public safety, but can enhance it through its fire prevention, investigation and fire safety education programs. The City of Pooler Fire-Rescue Department stands committed to the core values of integrity, valor, loyalty, professionalism and dedication. The department is also committed to those values that will strengthen our organization and will carry us forward into the coming years, such as diversity and fiscal responsibility.